This coming Friday, November 15th, we will be rolling out a new feature which will impact the way you are used to assigning interpreters. When assigning an interpreter to a job you have been presented with a list of interpreters to chose from which match the job requirements i.e. proximity, language, gender requirements and other requirements specified on the job. Up to now this list of interpreters was presented without factoring in interpreter availability. With the release on Friday, by default this list will now only show interpreters that are available at the date and time of the job. For example if interpreter Maria Blanco is assigned to another job at the same date and time as the job you are assigning, she will not be included in the interpreter list by default. When you uncheck the checkbox the list will refresh showing all matching interpreters regardless of availability. By using this feature and the interpreter calendar on the assign page you will easily see which interpreters might be best suited for the job and perhaps reassign interpreters as needed to better accommodate your full set of jobs. As a follow on to this, we will very shortly be releasing an additional feature in this area where your interpreters will be able to enter and manage their available days and times from the interpreter portal. 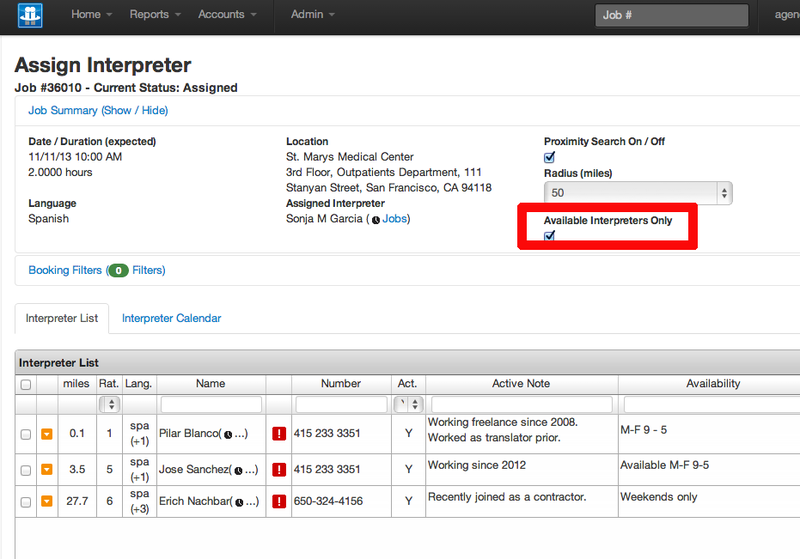 In this way the assign page will soon only show interpreters who are not already assigned to a job and have specified that they are available at the date and time of the job. You will be able to turn on / off this feature as needed by unchecking the “Available Interpreters Only” in the same way that was described earlier. If you’re an application administrator you will be interested to know that you can control the availability behavior in some small way. By default if a job an interpreter is assigned to, overlaps the job you are assigning they will not be presented by default. If a job an interpreter is assigned to finishes immediately before the job you assigning they will be presented as an option.